Gonzaga is No. 1 for the third straight week in The Associated Press college basketball poll. 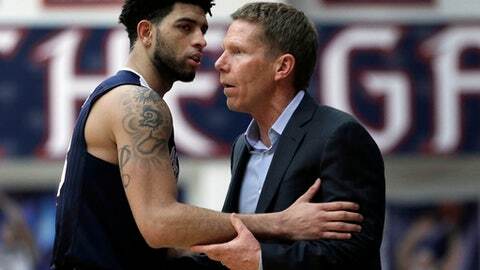 The Zags (26-0), the lone unbeaten team in Division I, received 60 first-place votes from the 65-member national media panel on Monday. Villanova (24-2), which received the other five first-place votes, and Kansas held second and third, while Baylor moved from sixth to fourth. The top four teams match those announced Saturday as the preliminary No. 1 seeds by the NCAA Tournament selection committee, although its order was Villanova, Kansas, Baylor and Gonzaga. Arizona jumped from ninth to fifth and was followed by fellow Pac-12 members UCLA and Oregon, while Louisville, West Virginia and North Carolina round out the top 10. Notre Dame returns to the poll at No. 25 after being out for one week. The Fighting Irish replace Xavier. Wisconsin dropped from seventh to 11th and was followed by Duke, Kentucky, Virginia, Florida, Purdue, Florida State, Cincinnati, SMU and Creighton. The last five ranked teams were South Carolina, Saint Mary’s, Maryland, Butler and Notre Dame. It was another week of losses by ranked teams, with 12 of the Top 25 losing last week. The week’s biggest jump and fall came from the same game. SMU moved from 25th to No. 19 and Cincinnati dropped from 11th to No. 18 after the Mustangs ended the Bearcats’ 15-game winning streak on Sunday. Duke, which beat North Carolina and Clemson last week, also moved up six places, from 18th to No. 12. Notre Dame, which was ranked for nine weeks before dropping out last week, returns to the poll after beating Florida State on Saturday. Xavier, which has been beset by injuries, dropped out from 24th after losing to Villanova. The Musketeers were ranked seventh in the preseason poll and returned last week after being out of one poll. The Atlantic Coast Conference leads the way with six ranked teams while the Big East, Big 12, Pac-12, Big Ten and Southeastern Conference all have three. Kansas will have two games against ranked teams this week, Monday against West Virginia and Saturday at Baylor. Other double-ranked games are Duke at Virginia on Wednesday, Virginia at North Carolina on Saturday and Maryland at Wisconsin on Sunday.